Truck driver Robert Smock walks away from a demolished 2013 Chevrolet Malibu in which Mary A. Hart, Vassar, was killed Sept. 5 after her car was struck by his truck on state Highway 268. A Vassar woman was killed Sept. 5 after turning on to state Highway 268 into the path of a truck pulling an asphalt trailer. 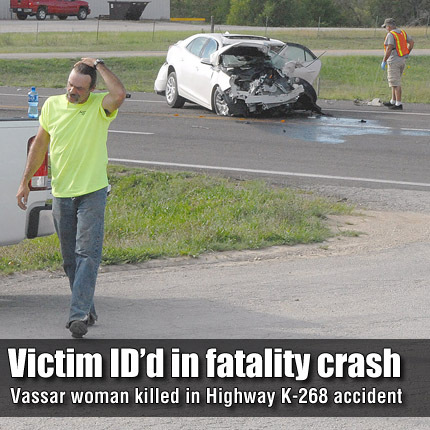 According to a Kansas Highway Patrol report, at about 3:34 p.m., Mary A. Hart, 72, Vassar, left Doman’s General Store, at the intersection of K-268 and Pomona Dam Road, and headed west driving a 2013 Chevrolet Malibu, when she failed to yield to the eastbound asphalt truck. The 2005 Mack truck, driven by Robert E. Smock, 42, Grantville, struck Hart’s vehicle on the driver’s side. The Malibu came to rest in the middle of the highway, while the truck veered off of the north side of the road 100-150 yards into a pasture. Hart died at the scene of the accident. Smock was listed in the KHP report as having possible injuries, but he declined treatment at the scene. Hart was not wearing safety restraints at the time of the accident, but Smock was. Both vehicles were heavily damaged and towed from the scene.